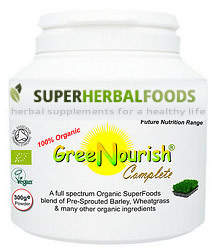 GreeNourish is the complete SuperFoods combination to support total nutritional status. Registered as a 100% ORGANIC food product with the Soil Association, this is a extraordinarily nutritious food combination which is suitable for all who wish to maintain great health, high energy levels and the feeling of well-being & vitality. Contains many of Mother Nature’s nourishing super foods in high Bioavailability food form. Pre-Sprouted Barley: Pre-Sprouted Barley utilises the latest patented scientific food technology, whereby all the natural active enzymes and nutrients in the barley grain are captured just prior to sprouting (the most nutrient and enzyme rich stage). The pre-sprouting stage also contains a wide variety of vitamins, minerals, amino acids and essential fatty acids. nutrients, vitamins, minerals, enzymes and soluble fibre. aids in the utilisation / assimilation of the formulation. Quinoa: This grain has a high protein content and added to support the amino acid profile of the Pre-Sprouted Barley and Wheatgrass. Kelp and Spirulina: These organic sea plants are naturally harvested and included as they offer a massive range of Vitamins, Minerals, Trace Elements and Amino Acids. We use only the best kelp ie the registered Seagreens® Ascophyllum type. Acai Berry: A South American berry high in antioxidants and fiber. Açaí is also rich in important Omega 6 and Omega 9 essential fatty acids, plus B - complex Vitamins, Vitamin C and many minerals including Iron, Calcium and Zinc. Popular with celebrities, Açaí is often referred to by health experts as the perfect superfood. Turmeric: A strong & proven antioxidant which also helps to inhibit the degradation of essential fatty acids. Flaxseed/Linseed: These organic seeds are rich in Omega 3 and Omega 6 essential fatty acids (oils) and lignans. They assist in energy generation and the fibre also adds bulk to stools in the bowel. Apple, Bilberry Fruit, Carrots, Lemon Peel, Spinach: These organic fruits and vegetables have been added to contribute to this All-In-One nutritious formula with their vitamins, minerals, trace elements, enzymes and natural dietary fibre. Alfalfa Peel: Rich in vitamins and minerals such as pro-Vitamin A (B-carotene), B6, C, D, E, K, P. Alfalfa also yields 10 times more mineral value than an average grain. Contains chlorophyll and contains 8 essential enzymes. Soluble fibre: Highly beneficial food fibre from fruits, vegetables, grains & seeds support digestive transit and internal cleansing / bowel cleansing and regularity. Contains NO added: Wheat, Lactose, Sugar, Artificial Colourings, Preservatives, Flavours or Yeast.